Matt Kap, the lead artist behind The Binding of Isaac: Rebirth and artist/animator for 1001 Spikes, has created Castle in the Darkness, a game he developed in his spare time over the course of a couple of years. 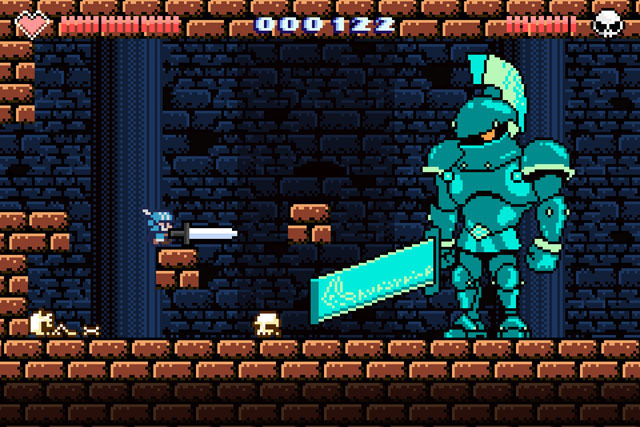 The game is a retro-style action-platformer-RPG inspired by classic NES games like Castlevania and Metroid, particularly in regards to its dark tone, but it's chock full of references to other games which are sure to tickle the nostalgia bone of longtime gamers. You play the part of the lone survivor of the royal guard who sets out to rescue the princess by battling his way through hordes of monsters and dozens of bosses. The game offers what seems like a straight path from beginning to end, but there are a number of branching paths leading to optional areas and bosses, offering up some of the game's best weapons and equipment. The game is currently available for PC via Steam. Check our full coverage here.